30Ene1930Ene19 MCHC 1000m 0.57.20 HdHd 2°	 2 5.80 528k 57k D. Grisales 16 al 6 [A] Lady Corthorn. (2) Ultimo Adios. (3¼) Rayo Real. 15Ene1915Ene19 MCHC 1000m 0.56.88 HdHd U°	 12¾ 6.80 534k 55k L. Silva 18 al 9 [A] Astroboy. (cb) Temple Of Doom. (1½) Sorprezon. 25Dic1825Dic18 MCHC 1000m 0.57.16 HdHd 6°	 1½ 4.80 522k 55k C. Caro 20 al 10 [A] Irrumpidor. (¾ cp) Noble Pingo. (1) Niker. 13Dic1813Dic18 MCHC 1000m 0.57.83 HdHd 2°	 1 5.80 530k 56k D. Grisales 15 al 8 [A] Alaraco. (1) Ultimo Adios. (1) Teotepec. 4Dic184Dic18 MCHC 1100m 1.03.95 HdHd 4°	 4 4.30 530k 55k D. Grisales 23 al 9 [A] El Pinturita. (3) Soy Unica. (3¾) Temple Of Doom. (*)29May18(*)29May18 MCHC 1000m 0.57.58 HdHd 1°	 2.20 535k 56k N. Figueroa 5 al 2 [A] Ultimo Adios. (4) Alexander Boy. (5) Soy Gringo. 24Ene1924Ene19 MCHC 1100m 1.03.72 HdHd 1°	 3.30 485k 56k J. Barril 4 al 2 [A] Hermano Ricardo. (VP) Don Rafa. (1¾) Vivir En Paz. 15Ene1915Ene19 MCHC 1000m 0.57.27 HdHd 3°	 2½ 14.90 485k 54k C. Rojas 8 al 4 [A] Peter Hansel. (¾ cp) Felimon. (2½) Hermano Ricardo. 10Ene1910Ene19 MCHC 1100m 1.03.49 HdHd 7°	 9¼ 23.50 484k 54k C. Rojas 11 al 5 [A] Whitney Child. (4½) Felimon. (6¾) Lady Corthorn. 25Dic1825Dic18 MCHC 1100m 1.04.01 HdHd 1°	 36.40 490k 56k J. Barril 1 [A] Hermano Ricardo. (1¾) Rayo Real. (1¾) Riveri. 18Dic1818Dic18 MCHC 1100m 1.03.93 HdHd 6°	 6½ 9.80 494k 55k L. Perez 4 al 2 [A] Vitale. (5¼) New Girl. (5¼) Chispeza. 30Ene1930Ene19 MCHC 1000m 0.57.20 HdHd 4°	 3½ 5.40 424k 59k G. Vera 16 al 6 [A] Lady Corthorn. (2) Ultimo Adios. (3¼) Rayo Real. 24Ene1924Ene19 MCHC 1100m 1.03.08 HdHd 7°	 10¼ 11.10 424k 55k A. Apablaza 22 al 12 [A] Irrumpidor. (¾) Temple Of Doom. (2¾) Malabari. 15Ene1915Ene19 MCHC 1000m 0.56.88 HdHd 4°	 3¼ 4.20 432k 59k A. Apablaza 18 al 9 [A] Astroboy. (cb) Temple Of Doom. (1½) Sorprezon. 10Ene1910Ene19 MCHC 1100m 1.03.25 HdHd 4°	 2 10.90 434k 55k J. Barril 28 al 13 [A] Aqui Estoy. (pz) Temple Of Doom. (2) Irrumpidor. 25Dic1825Dic18 MCHC 1000m 0.57.16 HdHd 4°	 1¼ 5.00 427k 59k J. Barril 20 al 10 [A] Irrumpidor. (¾ cp) Noble Pingo. (1) Niker. (*)13Dic18(*)13Dic18 MCHC 1000m 0.57.83 HdHd 1°	 4.00 426k 58k L. Perez 15 al 8 [A] Alaraco. (1) Ultimo Adios. (1) Teotepec. 5Feb195Feb19 MCHC 1100m 1.03.40 HdHd 8°	 9 13.30 415k 57k A. Apablaza 16 al 7 [A] Te De Tapit. (¾ cp) Teotepec. (3½) Olimba. 25Dic1825Dic18 MCHC 1000m 0.57.16 HdHd U°	 3¼ 7.60 404k 56k L. Soto 20 al 10 [A] Irrumpidor. (¾ cp) Noble Pingo. (1) Niker. 18Dic1818Dic18 MCHC 1100m 1.03.47 CdCd 2°	 1¼ 4.00 408k 59k M. Donoso [A] Liberty Soul. (1¼) Penonome. (5) Lady Corthorn. 4Dic184Dic18 MCHC 1100m 1.03.90 HdHd 1°	 31.70 405k 55k C. Rojas 8 al 6 [A] Penonome. (4) Irrumpidor. (7) Noble Pingo. 29Nov1829Nov18 MCHC 1000m 0.57.13 HdHd 8°	 6¼ 10.20 411k 56k G. Vera 9 al 5 [A] Soy Unica. (1) Chat Blanche. (1) Noble Pingo. 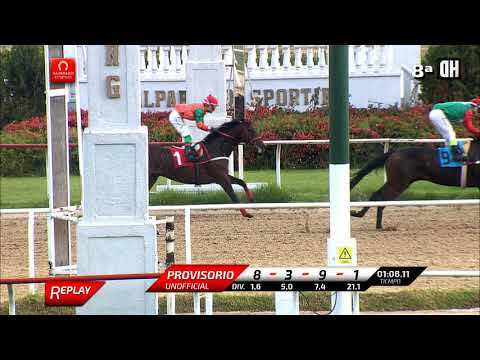 5Feb195Feb19 MCHC 1100m 1.03.40 HdHd 4°	 5¼ 13.10 454k 53k L. Paredes 16 al 7 [A] Te De Tapit. (¾ cp) Teotepec. (3½) Olimba. 24Ene1924Ene19 MCHC 1100m 1.03.60 HdHd 5°	 7¾ 2.80 450k 57k J. Barril 11 al 5 [A] Noble Pingo. (1½) Teotepec. (1¾) Lady Corthorn. 15Ene1915Ene19 MCHC 1000m 0.57.27 HdHd 2°	 ¾ cp 1.70 452k 57k D. Grisales 8 al 4 [A] Peter Hansel. (¾ cp) Felimon. (2½) Hermano Ricardo. 10Ene1910Ene19 MCHC 1100m 1.03.49 HdHd 2°	 4½ 6.90 453k 56k J. Barril 11 al 5 [A] Whitney Child. (4½) Felimon. (6¾) Lady Corthorn. 25Dic1825Dic18 MCHC 1000m 0.57.54 HdHd 2°	 Nrz 8.10 450k 57k J. Barril 8 al 4 [A] Lady Corthorn. (Nrz) Felimon. (½ cp) Tinto En Domingo. (*)8Nov18(*)8Nov18 MCHC 1100m 1.03.42 HdHd 1°	 14.20 448k 55k J. Barril 6 al 4 [A] Felimon. (1½) Irrumpidor. (1½) Tanquesillo. MT 4a (Sep) Stud V.S.A. 30Ene1930Ene19 MCHC 1300m 1.16.20 HdHd U°	 25¼ 2.80 526k 61k I. Carcamo 17 al 2 [A] Scatto Di Sorte. (3¼) Give Me A Break. (4½) Hamper. 21Jun1821Jun18 MCHC 1100m 1.03.56 HdHd 5°	 5¼ 3.10 530k 59k I. Carcamo 37 al 19 [A] Hermosa Flor. (½ cb) Pascua Island. (½ cp) Antartic. 15May1815May18 MCHC 1300m 1.15.87 ClCl CHCH 3°	 6¼ 1.50 532k 57k I. Carcamo [A] Saman. (3) Pascua Island. (6¼) Pioso Seco. 24Abr1824Abr18 MCHC 1100m 1.03.33 HdHd 1°	 1.20 529k 53k N. Figueroa 40 al 22 [A] Pioso Seco. (1¾) El Comodin. (9) Rayhana. 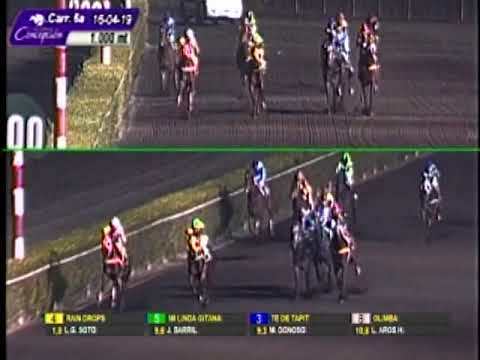 10Abr1810Abr18 MCHC 1000m 0.57.26 HdHd 1°	 1.80 530k 53k I. Carcamo [A] Pioso Seco. (1¼) Tata Matias. (6½) El Comodin. 5Feb195Feb19 MCHC 1000m 0.58.12 CdCd 5°	 9¼ 7.70 403k 57k J. Ayala [A] Full Moon Party. (3½) Gitana Soñadora. (5½) Siempre Bello. 24Ene1924Ene19 MCHC 1100m 1.04.68 CdCd 1°	 17.70 400k 57k J. Ayala [A] Ocho Por Cuatro. (4) Un Buen Dia. (6) Miss Charito. 15Ene1915Ene19 MCHC 1000m 0.57.78 CdCd 5°	 9½ 11.90 403k 57k L. Perez [A] El Pulento. (4¼) Centaurus. (4¾) Daddy Good Day. 10Ene1910Ene19 MCHC 1100m 1.05.23 CdCd 6°	 9¼ 8.00 403k 57k L. Silva [A] Morroco. (1¾) Crystal And Gold. (2¾) Centaurus. 25Dic1825Dic18 MCHC 1000m 0.58.20 CdCd 9°	 15¾ 4.60 404k 57k N. Figueroa [A] (½) Siempre Bello. (2½) Morroco. (7¼) Tata Vicho. 5Feb195Feb19 MCHC 1100m 1.03.40 HdHd 3°	 3½ 2.10 480k 60k D. Grisales 16 al 7 [A] Te De Tapit. (¾ cp) Teotepec. (3½) Olimba. 30Ene1930Ene19 MCHC 1100m 1.03.80 CdCd 1°	 $3.50 478k 59k D. Grisales [A] Olimba. (5) Sahtir. (6¼) Morroco. 24Ene1924Ene19 MCHC 1100m 1.03.08 HdHd 5°	 9½ 9.00 480k 53k N. Figueroa 22 al 12 [A] Irrumpidor. (¾) Temple Of Doom. (2¾) Malabari. 10Ene1910Ene19 MCHC 1500m 1.29.87 HdHd 4°	 4½ 3.80 490k 60k G. Vera 13 al 2 [A] Hamper. (1½) Give Me A Break. (2¾) Paf Daddy. 25Dic1825Dic18 MCHC 2000m 2.02.87 ClCl ClCdClCd 5°	 13¼ 5.40 488k 55k N. Figueroa [A] Te De Tapit. (1¼) Hamper. (6¼) Milan. 17Ene1917Ene19 HHCH 1000m 0.59.48 HdHd U°	 10½ 13.30 474k 56k P. Zúñiga 21 al 16 [A] Puede Ser Feliz. (1¼) Wishyouluck. (1¼) Cherokee Queen. 3Ene193Ene19 HHCH 1000m 0.59.98 HdHd 10°	 8½ 70.90 475k 52k P. Zúñiga 27 al 17 [A] Gaturro. (¾ cp) Club Altos. (2) Koekkoek. 20Dic1820Dic18 HHCH 1000m 0.58.07 HdHd 13°	 18 178.00 474k 52k G. Inostroza 30 al 18 [A] The Magic. (6½) Churchill Downs. (8¼) Congraciada. 22Nov1822Nov18 HHCH 1000m 0.59.35 HdHd U°	 15¾ 60.00 474k 56k M. Contador 27 al 14 [A] The Master Blue. (1½) Gran Pacoli. (2¾) Lebrun. 12May1812May18 HHCH 1200m 1.12.47 HdHd U°	 22 45.00 471k 56k A. Covarrubias 28 al 22 [A] Un Buen Amigo. (1½) Arranca Dominguín. (3) Roman Lawyer. (*)9Dic17(*)9Dic17 HHCH 1000m 0.58.71 HdHd 1°	 4,60 467k 50k E. Toledo 40 al 31 [A] Little Man. (3) Lluvia Oriental. (3) Pa Que Vine. 30Ene1930Ene19 MCHC 1300m 1.16.20 HdHd 3°	 4½ 3.30 518k 59k L. Perez 17 al 2 [A] Scatto Di Sorte. (3¼) Give Me A Break. (4½) Hamper. 10Ene1910Ene19 MCHC 1500m 1.29.87 HdHd 1°	 1.60 515k 58k L. Perez 13 al 2 [A] Hamper. (1½) Give Me A Break. (2¾) Paf Daddy. 25Dic1825Dic18 MCHC 2000m 2.02.87 ClCl ClCdClCd 2°	 1¼ 5.70 516k 57k L. Perez [A] Te De Tapit. (1¼) Hamper. (6¼) Milan. 4Dic184Dic18 MCHC 1600m 1.35.75 ClCl ClCdClCd 3°	 3¼ 14.90 512k 57k L. Perez [A] Milan. (1¾) Olimba. (3¼) Hamper. 13Nov1813Nov18 MCHC 1400m 1.21.42 ClCl ClCdClCd 8°	 13¾ 10.00 510k 57k L. Soto [A] Milkao. (4) Gran Winner. (5) Milan. 30Ene1930Ene19 MCHC 1000m 0.57.20 HdHd 1°	 4.90 432k 56k J. Ayala 16 al 6 [A] Lady Corthorn. (2) Ultimo Adios. (3¼) Rayo Real. 24Ene1924Ene19 MCHC 1100m 1.03.60 HdHd 3°	 1¾ 7.10 430k 57k J. Ayala 11 al 5 [A] Noble Pingo. (1½) Teotepec. (1¾) Lady Corthorn. 15Ene1915Ene19 MCHC 1000m 0.56.88 HdHd 5°	 5½ 7.30 432k 54k N. Figueroa 18 al 9 [A] Astroboy. (cb) Temple Of Doom. (1½) Sorprezon. 10Ene1910Ene19 MCHC 1100m 1.03.49 HdHd 3°	 6¾ 12.80 433k 58k N. Figueroa 11 al 5 [A] Whitney Child. (4½) Felimon. (6¾) Lady Corthorn. 25Dic1825Dic18 MCHC 1000m 0.57.54 HdHd 1°	 6.30 430k 58k N. Figueroa 8 al 4 [A] Lady Corthorn. (Nrz) Felimon. (½ cp) Tinto En Domingo. 5Feb195Feb19 MCHC 1100m 1.03.40 HdHd 1°	 $16.50 409k 58k L. Mardones 16 al 7 [A] Te De Tapit. (¾ cp) Teotepec. (3½) Olimba. 30Ene1930Ene19 MCHC 1100m 1.03.80 CdCd 5°	 6½ 3.10 408k 61k L. Mardones [A] Olimba. (5) Sahtir. (6¼) Morroco. 10Ene1910Ene19 MCHC 1000m 0.57.72 CdCd 1°	 5.10 412k 59k L. Soto [A] Te De Tapit. (Nrz) Sahtir. (½ cp) Jacinto Y Que. 25Dic1825Dic18 MCHC 2000m 2.02.87 ClCl ClCdClCd 1°	 24.60 406k 57k L. Mardones [A] Te De Tapit. (1¼) Hamper. (6¼) Milan. 13Dic1813Dic18 MCHC 1000m 0.57.83 HdHd 8°	 7¼ 27.60 403k 54k L. Riquelme 15 al 8 [A] Alaraco. (1) Ultimo Adios. (1) Teotepec. Preparadores: (1) Victor Gallardo E., (2) Joan Amaya H., (3) Joan Amaya H., (4) Joan Amaya H., (5) Joan Amaya H., (6) Alberto Pinochet P., (7) Luis Leal J., (8) Reinaldo Chamorro B., (9) Joan Amaya H., (10) Alberto Pinochet P., (11) Luis Leal J., (12) Ercira Alarcón J.